BlueBay Grand Esmeralda is a luxury 5-star hotel located on a powder-white beach in Playa del Carmen, with a backdrop of lush mangroves. A tranquil private beach, excellent restaurants, a relaxing spa, three swimming pools and first-class all inclusive facilities are what makes this hotel a favourite for families, couples and solo visitors alike. 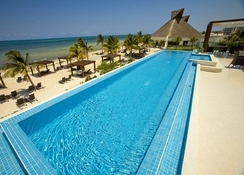 BlueBay Grand Esmeralda is famous for its warm hospitality and eco-friendly practices, with well-appointed rooms available to ensure ultimate comfort. 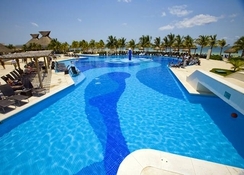 Recreation activities are aplenty too, with swimming pools, children's areas, a private beach, spa facilities, a gym, a golf course, plus lots of attractions to explore in the surrounding Riviera Maya area – including the Mayan Ruins, Isla Mujeres, Xcaret eco-park and Xelha diving activities. 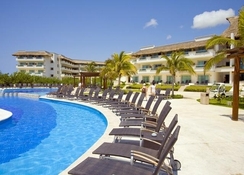 BlueBay Grand Esmeralda is situated in a private strip of beach in Playa del Carmen, in Cancun's Riviera Maya. It's a short walk away from the famous 5th avenue shopping and dining area. The nearest airport is Cancun International Airport, around 45km away. Downtown Cancun is about an hour drive from the hotel. The hotel has 979 well-furnished, air-conditioned rooms with a balcony or terrace offering excellent views or the sea, garden, or both. These rooms are categorised into Deluxe Garden View, Deluxe Partial Ocean View, Deluxe Ocean View, Deluxe Jacuzzi Suite and Swim Up Suite Garden View. All accommodation options are equipped with air conditioning, en-suite bathroom, internet, mini-bar, coffee maker, iron and board, hairdryer and satellite TV. The Jacuzzi and Swim-up suites also come with a hot tub and access to a private pool. The BlueBay Grand Esmeralda features a variety of buffet-style and a la carte restaurants with talented chefs serving up Gourmet French, Italian, Mexican and Oriental cuisines. There is an international buffet restaurant Jaal-Ha that serves breakfast and lunch. There’s also a grill and a round-the clock Sports Bar. The BlueBay Grand Esmeralda has amazing recreational facilities that includes three swimming pools, a spa, private beach, golf club and a gym. 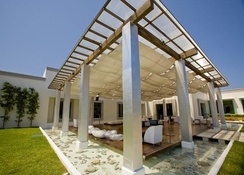 The BlueBay Spa offers total relaxation with many rejuvenating treatments and therapies. 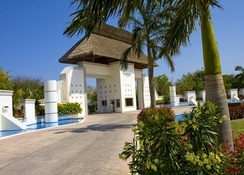 The hotel also has tennis courts, volleyball courts, a golf course, a theatre, and table tennis to offer. Children can head to the kids’ club. There is also a nightclub where guests are treated to live music and other shows every evening. For a first visit to Mexico;it gives the best first impression of a beautiful country,and its friendly people. 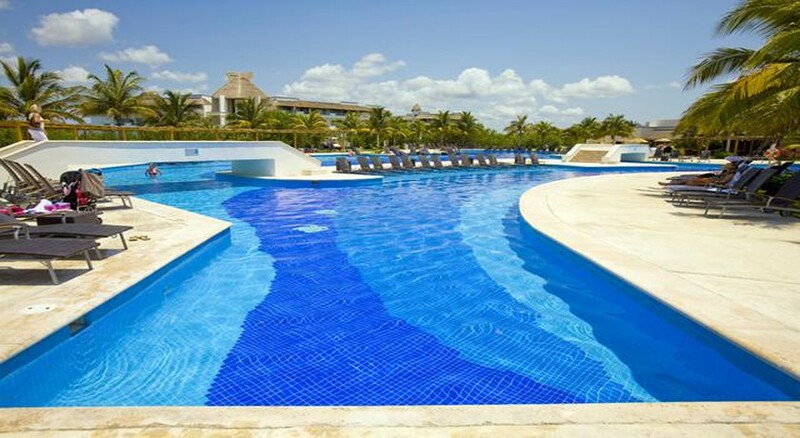 The all round offering from concierges excellent customer service delivery,six specialist restaurant nights which you can repeat,and the hour of big show entertainment,means that when going to Mexico again,this the only hotel to be considered;no question! It is not a long transfer from Cancun Airport either. I fully recommend it, endorse it;you'll definitely enjoy it! Clean facilities, lovely and hardworking staff and amazing food. Only drawback was how busy it was which sometimes meant it was loud at night but we were so relaxed it rarely bothered us. There were regular buses around the resort and trips available from the foyer. Pools were clean. Drinking water is purified. The beach was artificial and the sea a little dark with sea weed when we went in July. Would definitely stay again though. From start to finish the hotel was FANTASTIC!! I read some of the reviews before leaving and saw some comments on the food. Please ignore the negatives everything was perfect, fantastic varieties and anything you asked for they would accommodate. The facilities where amazing from the pools and bar staff to the entertainment. We are considering booking another holiday to this hotel this year! Hotel was nice and clean, entertainment staff very good considering we went in January. Good choices in the evening very good although the food at pool restaurant was not very nice, always cold and not much choice. The receptionist aren’t very helpful and all look like they have the ump. The food is very much the same every day and the staff are over worked. The entertainers really try hard to keep everyone happy but they just do not have the resources. The wildlife is amazing but probably isn’t to everyone’s taste. The beach isn’t the best but we were already aware of this because it is man built but if you walk further down you find a lovely lagoon.